Have you ever thought of working in the childcare and education industry? What would suit you best? 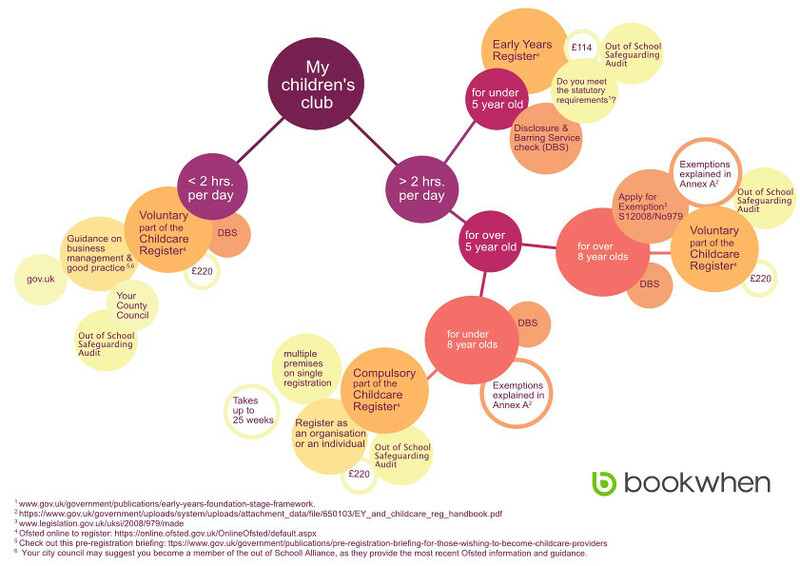 A weekend club, holiday club, breakfast or out of school club? The Bookwhen team started navigating the sea of information and regulatory guidance documents to help you decide which route to take. We’ve added a few links below, we hope these will get you going on your journey to building a successful children’s activity business. If you decide to run a club on premises that are already Ofsted registered, you can work with the managers of the premises and you do not need extra registrations for your club. Off you go! If you are planning on using a premise that is not Ofsted registered, there are a few decisions to take. The first is about your activity schedule. If your club runs for two hours a day or less, you will not be required to register with the Compulsory part of the Childcare Register. However, it is recommended that you register with the Voluntary part of the Childcare Register, to ensure you are complying to the right standards. You can register online through Ofsted1, it costs £220, and the process takes up to 25 weeks. From birth to the 31st August following their fifth birthday, you will apply through the Early Years Register (cost: £114). After the 31st August following their fifth birthday, and up to the 31st August following their eighth birthday, you will apply through the Compulsory part of the Childcare Register (cost: £220). 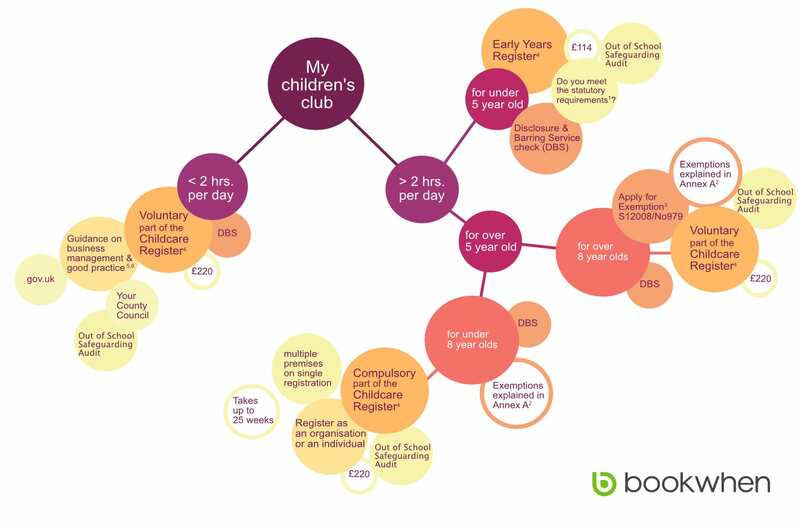 From eight year old onwards, you can apply to register with the Voluntary part of the Childcare Register if you choose to. In each of the three cases above, you can register online through Ofsted1, and the process takes up to 25 weeks. Ofsted carries out a series of checks on applicants and all individuals connected with the application. If you are registering for the Voluntary part of the Childcare Register, you need to apply for an exemption from the Compulsory part of the Childcare Register (exemptions are listed in Annex A of the handbook2). Before submitting their application to Ofsted, all applicants on your form will need to complete a Disclosure and Barring Service (DBS) check online3 (see Annex B & C of the handbook2). This takes a few weeks, so start the process early on. What if you have multiple premises? If you are working with a multitude of premises, you will need to register them all on one single registration to Ofsted. You can then apply to add premises to your registration at any time. And children covering multiple age brackets? If you work with children of all ages, you may need to apply on both registers. The Early Years Register, and the Childcare Register. At this stage, you should probably call Ofsted for guidance: 0300 123 1231. Whether you are setting up a private, voluntary, or independent childcare activity, it is your responsibility as the owner or management committee, to ensure that the arrangements for safeguarding children comply with current guidance from government and from your local city council. The resources to refer to for ensuring you are complying are: the Out of School Safeguarding Audit4, and the Safeguarding Children Guide5. You can also refer to the Pre-registration briefing information before you get started on your journey as a children’s activity organisation6. Once you decide to launch your business, our city council recommends you become a member of the Out of School Alliance, as they provide all the most recent Ofsted information and guidance.